Bounce or break? GBP/AUD is currently testing the rising trend line support on its 4-hour forex time frame, still deciding whether to head further north or to take the southbound route. 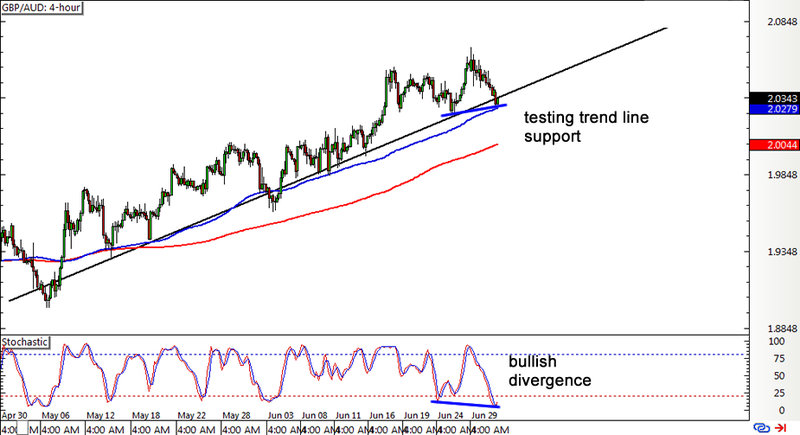 A bullish divergence can be seen, with price forming higher lows and stochastic drawing lower lows, indicating that a move towards the previous highs at 2.0680 might take place. Price is also finding support at the 100 SMA, which acted as a dynamic inflection point in the past and is still treading above the longer-term 200 SMA, suggesting that the uptrend could stay intact. A break below the 2.0300 major psychological mark and trend line might be a sign that a reversal is in order. 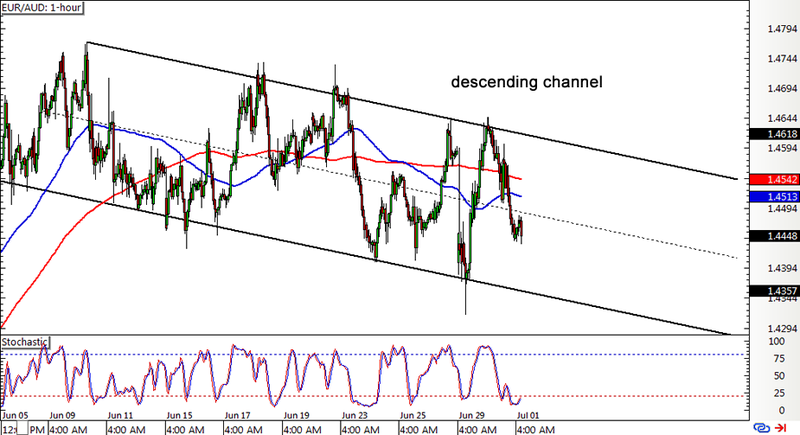 Here’s a simple trend setup that’s starting to play out on EUR/AUD’s 1-hour forex chart. The pair has been moving inside a descending channel, indicating that a short-term downtrend is taking place. Price just bounced off the top of the channel and seems to have its sights set on the channel support near the 1.4300 major psychological level. If you’re up for a countertrend trade, you could wait for reversal candlesticks to form around the bottom of the channel before going long. Stochastic is turning up from the oversold territory, suggesting that euro bulls might be ready to charge soon. The 100 SMA is below the 200 SMA, though, suggesting that the path of least resistance is to the downside. 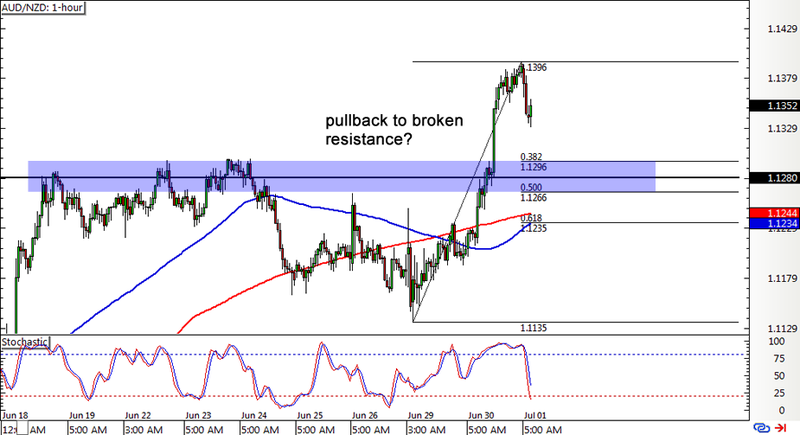 Last but not least is another potential pullback play on AUD/NZD’s 1-hour forex time frame. The pair just surged past the resistance around the 1.1300 major psychological level then zoomed up close to the 1.1400 major psychological mark before showing signs of a retreat. Using the handy-dandy Fib tool on the latest swing low and high shows that the 38.2% to 50% retracement levels line up with the former resistance area, which could now hold as support. Stochastic is still moving down, confirming that a correction is taking place, while the 100 SMA looks ready to cross above the 200 SMA to indicate that the uptrend might carry on.